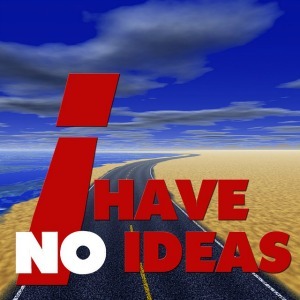 ‘I’ for ‘I have no ideas’? Certainly not! There is no dearth of inspiration for blogging, but there are times when we do get stuck wondering what to blog about. I thought I’d put together a few sources where a blogger can find interesting subjects to blog about both online and offline. Topsy (since closed)- this site enables you to add a keyword and get the top tweets and topics trending on this subject. Alltop – this aggregates leading posts on various topics. So you can search for top posts within your niche or any ideas that appeal to you. Google Trends – tells you what people have been searching for. Find a search that interests you and write your own thoughts on it. One top search in India at the moment is on Jashodabhen – the wife (or not) of the BJP Leader who has in the past claimed to be single. 2. Magazines, newspapers, TV, movies and songs – These are all great sources of content ideas. Magazines and newspapers reflect what’s making news and current trends. Television serials, movies and songs are great because you can blog about what’s current, or bring something out from long ago and do a sentimental post about it. 4. Books and quotes – I love reading and any blogger worth her salt, should too. There are loads of ideas out there in the books we read. Quote from them, write about them, put a new spin on them. Most of us love quotes. Although, I know of at least one man who doesn’t – my husband. But I know a good quote can set you off on a whole blog post. I collect quotes of famous people like they’re going out of fashion. And if I really admire the person, they get a whole post dedicated to them and what they’re saying. Like, Wisdom From Iyanla Vanzant. 5. Forums – There are a lot of blogging forums out there where you could also find like-minded people who can give your ideas when you are stuck. There are some good blogging groups on Facebook, and I do love BlogCatalog where you can start a discussion and gather opinions – all fodder for your posts. 7. Your blog – ‘Huh?’ you say? Yes, indeed. Set up an analytics software that lets you know which of your posts are popular and lets you know what searches brought people to your blog. So you know what you’ve done right and do more of it. Also, think of your ‘best readers’ – people who are regulars on your blog. Think of what they like to read and write for them. 8. Your own life – While all the of the above sources are online – the greatest source for blogging content is your own life. Our own experiences – because they’re personal, help us connect with your readers. I do that very often and I find that even the struggles I write about resonate with others. Then there’s always food, travel, holidays and experiences with Nature that we can blog about. a. Maintain a file – online or offline – of all the ideas that occur to you, as and when they do. If have plenty of little notes in a folder marked ‘fodder’. b.Note down resources – names of books, articles, songs etc. If they’re online bookmark the pages. c. Discuss your ideas with someone else, preferably someone who knows you well and is a regular reader of your blog. Share ways you find ideas for your blog posts. PS: There are plenty of resources out there, if only we are prepared to ‘listen’. Read this guest post by Tony Teegarden on Kikolani: Finding Your Blogging Inspiration In 3 Easy Steps. On a slightly different note, read this from Darren Rowse of ProBlogger: How to Keep Inspired When Blogging Gets Tough. This post is written for the letter ‘ I’ for the Blogging From A to Z April Challenge 2014. 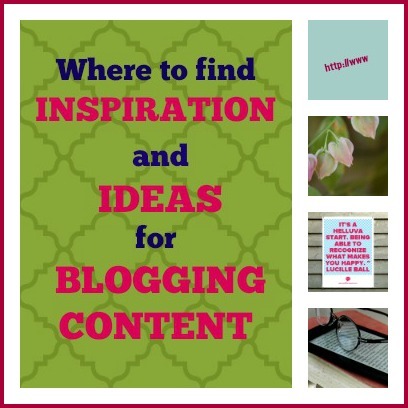 Thanks for listing all the blog inspiration sites! I will check them out – I need all the help I can get. Write from your heart – the best advice. And I love personal posts a whole lot more than fiction. Thanks for sharing so many resources. Corinne what a post 🙂 A treasure trove,tks. Hi Corrine, I hope you are feeling better as this week comes to a close. I have bookmarked your page under blogging hints and tips. The search and social trends are news to me. #8 is spot on. When I was participating in the January 2014 Ultimate Blog Challenge I wrote down any problems that I had with relation to my business or social media or website issues, then I would google how to solve the problem and write a blog post about the problem and how other people can resolve it should they also have the same problem in the future. Thats another informative and useful post ! For me POint 8 works the best, so much to write about LIFE ! Great information as usual! Thanks for the links. Bookmarking. One of my favorite lines from the movie Finding Forrester is “Write with your heart. Then rewrite with your head.” I think it is so important to write from the heart. Get it out in all of its mess, take a breather, and then clean it up for publication. This is a very helpful list for us writers. Thank you. Books, quotes, WRITE TRIBE and of course writing from the heart….great post Corinne! Loved this – and precisely why I featured you on my blog today! I would like to add, listening to conversations. Not just eavesdropping, but really listening to people and what they say to you, how they react – all great fodder for the bloggy blog! Superb resources, Corinne. Thank You! As for me, I ADORE quotes. This is usually how I begin my blogs! That’s one of the most useful posts Corinne. So many times we’re just stuck for lack of inspiration, though of late there’s always been WT to fall back upon but these are super tips. Thank you. Thanks for sharing such wonderful ideas with us . Your mantras about blogging are really helping me out 🙂 Though I started in a lighter note but after joining events and challenges I am turning out to be a regular one . Thanks for this article at the right time. I was searching for new ideas for UBC..
A very useful and handy compilation of important ideas and links. Will book mark them for future use. Great resource Corinne. I sometimes run out of ideas and I’ll come back to this when I do. Thanks, Ana. Nice connecting with you. But, this list is a great idea, Corrine. You will help many a soul. I know a gregarious person like you won’t have any shortage of ideas and anecdotes, Roy! All great points Corinne 🙂 And, thanks to Write Tribe and yeah write, I am rarely at a loss for prompts. Long live such sites! Useful set of resources you’ve listed there. Glad you liked them, Shailaja. There are some good points raised here! Glad you liked them, Nick. I would never associate a writer’s block with you! Oh my goodness, how timely is this! As I work through the Ultimate Blog Challenge, and I tell myself I want to keep the momentum flowing even after April, this blog post comes just in time! Thank you so much for the great list of ‘inspiration’ I’m excited to come back often and pick at it! Great ideas for inspiration. I’ve been blogging since 2007 and for me, books, quotes, my own life, and writing prompts seem to be a never ending source of inspiration! Rock on! I don’t see you running out of ideas, PB, with the full life you lead. Very helpful post. Bookmarking it for ongoing reference. I like the last tip the most – write from the heart 🙂 Everything else falls into place when we remember this, I think! Thanks Corinne. Spot on, Beloo. Start from the heart – everything else falls into place. Glad you liked them, Nabanita. Thanks to preparation for the A-Z Challenge, I have no dearth of subjects right now. However, your suggestions, particularly 1 and 5, will be useful later. Thank you! The A to Z is a great way to get the creative juices going! Glad you found some points useful. Solid list of sources, Corinne! May I add “camera” to this? I find that just going through my photo albums brings back memories that are great fodder for posts! Catch you ever being at a loss for inspiration for a blog post! You know I am looking forward to your J post!